Despite its brief renaming as the Reunification Palace after the fall of Saigon to communists, the Independence Palace now stands with its original name intact. This government building has a long history that extends to the French occupation in the 19th century. 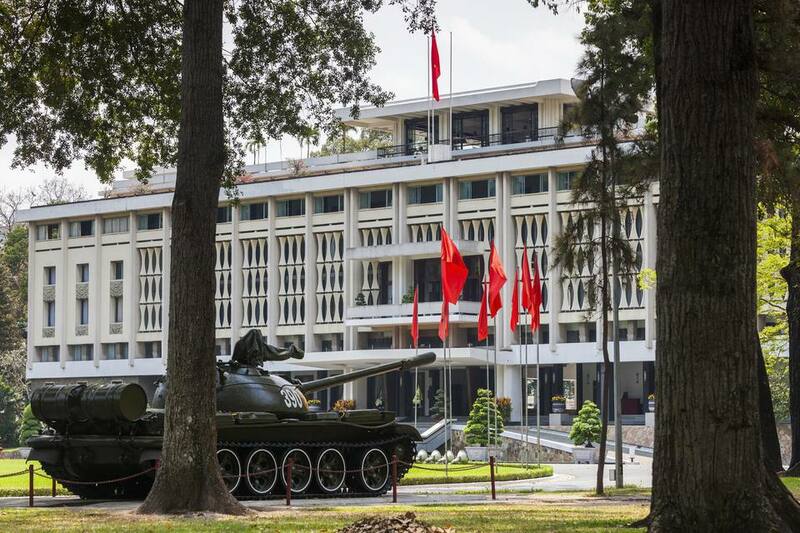 During the Vietnam War, it served as home and command center of General Nguyen Van Thieu, the head of a military junta who came to power after the first President of South Vietnam was assassinated in 1963. The Independence Palace was the site of a dramatic finish to the Vietnam War as tanks crashed through the main gate on the morning of April 30, 1975. Today, the Independence Palace is a time capsule unchanged since the 1970s - a must-see in Ho Chi Minh City, and a major stop for history buffs taking the grand tour of Vietnam. The Independence Palace occupies a large, green plot in District 1 of Central Saigon. The only entrance for tourists is through the main gate on Nam Ku Khoi Nghia situated on the eastern side of the palace grounds. From the tourist district of Pham Ngu Lao and Bui Vien, walk east past the large Ben Thanh Market, then turn left and walk north on Nam Ky Khoi Nghia. Attractions inside of the airy palace interior are pretty sparse. Roped-off rooms such as the presidential office, receiving room, and bedroom appear musky and grim with antique furniture and bare walls. A highlight of the Independence Palace is found in the basement which includes a command bunker with old radio equipment and strategy maps on the walls. After exiting the basement into the courtyard, there is a room filled with historic photos - heavily sprinkled with propaganda - portraying the fall of the Independence Palace. As with the War Remnants Museum, the photos tell the side of the victors of the Vietnam War, not that of the Americans'. A climb to the fourth floor rooftop yields some nice views of the palace grounds as well as an old US UH-1 helicopter. The rooftop was used as a helipad for evacuating staff just before the palace was overrun. Before exiting the gate, check out two of the original Russian T-54 tanks - used in the capture of the palace - parked on the lawn. Norodom Palace - the French colonial headquarters in Saigon - was built in 1873 and occupied by Ngo Dinh Diem, the first president of South Vietnam until two rogue pilots dropped bombs on the structure during an assassination attempt in 1962. One bomb actually fell into the wing where President Diem was reading, but failed to detonate! President Diem ordered the damaged palace to be demolished and enlisted the help of renowned architect Ngo Viet Thu to build a more modern replacement. President Diem was assassinated in 1963 before construction of the new palace was completed. General Nguyen Van Thieu - head of a military junta - moved into the completed palace in 1967 to serve as the second president of South Vietnam; he changed the name to Independence Palace. Independence Palace served as central command for the South Vietnamese effort against communist forces until April 21, 1975 when General Thieu was evacuated as part of Operation Frequent Wind - the largest helicopter evacuation in history. On April 30, 1975, a North Vietnamese tank crashed through the palace gates, leading the way for Communist forces to capture the palace. The Vietnam War literally ended at the Independence Palace gates. Open Hours: Daily from 7:30 a.m. to 4 p.m. The ticket window closes daily between 11 a.m. and 1 p.m. The palace closes sporadically for special events and visits from VIPs. Entrance Fee: VND 40,000 (about US$ 2), to be purchased at the main gate before entry. Visitor Dos and Don't's: All visitors must pass through security and have bags screened. Dangerous objects such as pocketknives are not permitted. Small backpacks are allowed inside, however larger luggage must be left at security. Do not walk on the grass or touch displays around the palace. There are very few signboards or explanations of rooms and displays - an English-speaking guide will greatly enhance your visit. Free tour guides can be arranged in the lobby or you may join a group already in progress. For more information, visit the Independence Palace's official site.